Three weeks ago, I began a 12 month position as a Project Conservator with the LHSA. I graduated last year from Northumbria University with an M.A. in Fine Art Conservation where I specialised in ‘Works of Art on Paper’ and prior to taking this position I had been working at the Alnwick Castle Archive as a Paper Conservator. Therefore, the type of material found in this collection is quite different from what I have worked with previously, but the conservation principles are the same and I am looking forward to the challenges of working with this modern collection in the coming months. Over the next year I will be blogging about the unique conservation issues that collections such as this pose and how I have treated various aspects of it. The first suspected case of HIV/AIDS in Scotland was discovered in Edinburgh in 1983. The infection rate in the city steadily grew and by 1989 it was seven times higher than the national average, which led to Edinburgh being dubbed the “AIDS capital of Europe” in the national press. LHSA collected documentation regarding the medical and social response to the disease in Edinburgh and the Lothians and in 2011 the collection was inscribed to the UNESCO UK Memory of the World register, highlighting its importance to national documentary heritage. It is an extremely valuable archive that records the changes in response to HIV/AIDS, from firstly focusing on homosexual transmission and infection through blood transfusions, then transmission between heterosexual partners and finally infection due to the sharing of needles and mother to child transmission. Policies formed at this time, in terms of awareness and prevention campaigns as well as care of patients, went on to inform national policy. Therefore, this is an archive of vital importance which comprehensively documents an important part of medical history. 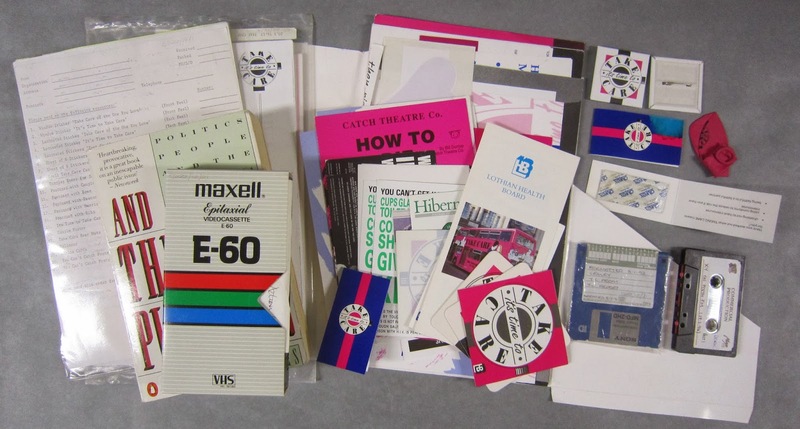 The collection itself is made up of a variety of media, mostly loose paper documents, but also badges, stickers, photographs, 35 mm slides as well as rubber and latex items such as condoms and balloons. There is also a collection of digital media such as 3.5” floppy disks, VHS, audio cassette tapes and film reels which need to be transferred to modern storage facilities to avoid loss of this data due to deterioration of the object or the obsolescence of viewing equipment. 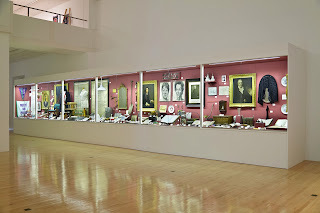 The photograph below show the diversity of objects found in the collection, often stored together in unsuitable housing. Varied collection of objects found in GD22, an accession which documents the "Take Care" awareness campaign. Despite its importance, only basic preventative conservation methods have been carried out on some of the collection, such as the storing paper documents in archival boxes. So, over the next year I will be rehousing the entire collection and carry out conservation treatments such as surface cleaning, tear repair and flattening where necessary. Since starting three weeks ago I have been very busy; meeting all my colleagues at LHSA and CRC (Centre for Research Collections) and finding out what they do, inductions to the library and getting to know the conservation studio and the collection I will be working with. I have also carried out a detailed survey of the collection and put together a conservation proposal for GD22. This accession contains documents relating to the public awareness ‘Take Care’ Campaign and treatment of this is now well under way. It’s been a great start to the project and I am looking forward to working with this fascinating collection over the next year. Aneurysms occur when weakness in the walls of veins or arteries cause a ‘bulge’ when blood passes through them. This weakness can produce bleeding, a haemorrhage, when the walls of the vessel rupture. In the field of surgical practice, Norman Dott stands out for his pioneering 1931 operation to treat an intracranial aneurysm by direct surgical intervention into an area called the Circle of Willis, a loop of arteries at the base of the brain. Since these arteries sit near the brainstem, through which the nerves that connect the brain to the motor and sensory systems of the rest of the body pass, operating in this area carried a great deal of potential risk in the early days of Dott’s ground-breaking surgeries. This first operation on such an aneurysm was carried out on a middle-aged patient whom Dott described as a ‘personal friend and benefactor’. Dott wrapped the area of the aneurysm with muscle from the patient’s leg in order to strengthen the blood vessel walls where they were thinning dangerously. Weary of seeing patients die from brain haemorrhages, post-mortem observations had led Dott to realise that brain haemorrhages could sometimes heal themselves by blood-clots that stemmed further leakage, and that surgery could perhaps ‘reinforce Nature’s attempt at healing’ through providing another form of ‘scaffolding’. Although he was advised against surgical intervention for fear of fatality (for medical specialisms such as neurosurgery in their relative infancy could ill afford a high mortality rate), Dott proceeded with the operation in April 1931. Despite the risks, the operation was a success, with the patient’s only complaint being a pain in his leg from where the muscle graft was taken! However, such surgery was a major undertaking and carried considerable risk. For aneurysms of the carotid artery, Dott practised tying (ligation) of arteries, shutting off blood-flow to the aneurysm, a practice that he pioneered in 1932, just a year after his pioneering aneurysm wrapping operation. The process of detecting aneurysms was considerably aided in 1933, when Dott was the first to demonstrate an aneurysm by means of angiography, an x-ray technique that involved operating on the patient under anaesthetic to expose the artery, injecting it with a dye and subsequently taking x-ray films. We are extremely lucky at LHSA in holding a large collection of x-rays and photographs of Dott’s diagnostic procedures – both ventriculograms and angiograms. 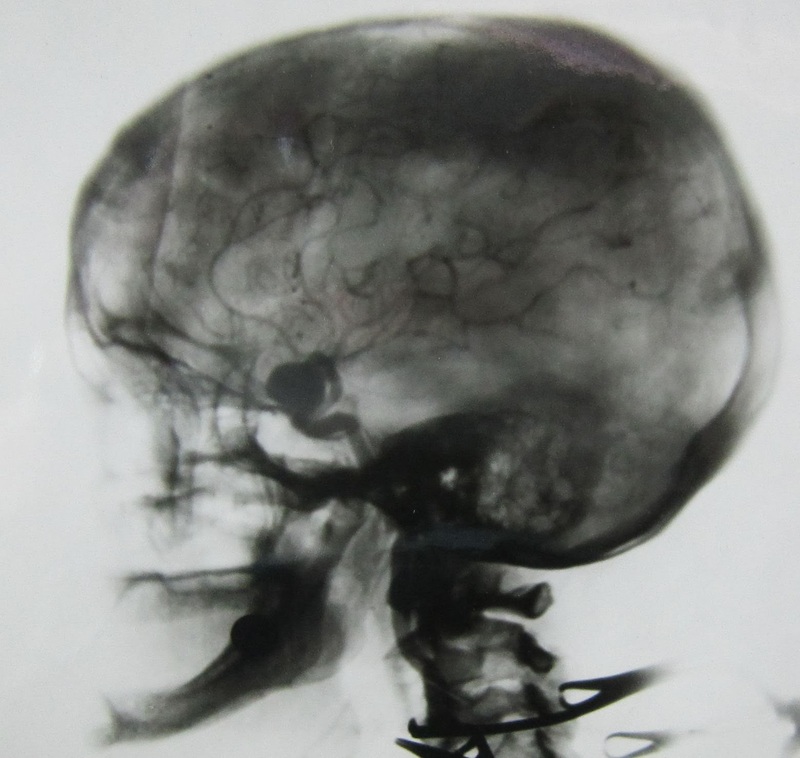 In the age of Magnetic Resonance Imaging (MRI) and Computerised Tomography (CT) scans, it is easy to forget how invasive these x-ray diagnostic procedures were for patients (operations in themselves), and how privileged visions inside a patient's head could not be taken lightly in these relatively early days of neurosurgery. LHSA staff, in conjunction with colleagues from across Information Services at the University of Edinburgh, have been exploring the possibilities of using Archives Space as a cataloguing tool. The University of Edinburgh is the first European institution to sign up as a General Member of the community and we’re excited by the possibilities it brings to transform our cataloguing. In 2012, LHSA started creating item-level descriptions of case notes in the archival encoding language of Encoded Archival Description (EAD) as part of the Wellcome Trust-funded Norman Dott project but the remainder of our catalogues are currently created in Word documents and transferred into PDFs for the website: http://www.lhsa.lib.ed.ac.uk/collections/index.html. Whilst our catalogues are fully available, this system is somewhat cumbersome to administer and does not create the best interface for users trying to find out what we have in our collection. Archives Space offers a much more straightforward and streamlined approach to cataloguing for Archive staff, interns and volunteers, with the potential for easier searches and improved visibility across archive search engines meaning a vastly improved user experience. 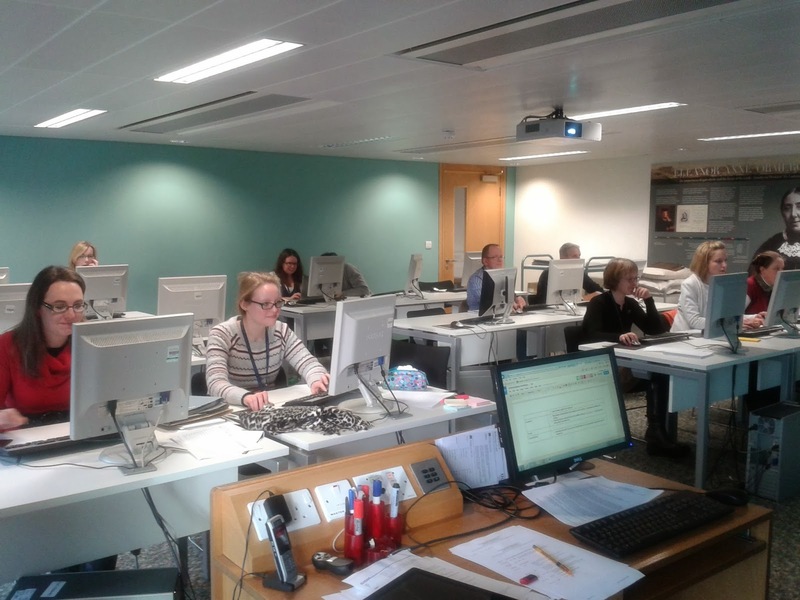 Earlier this week archivists, librarians and developers were involved in a one day workshop to test its functionality with real-life collection items. Any issues that cropped up were investigated and discussed, and questions were put at the end of the day to one of the US-based developers via a Skype call. All in all, a very positive and useful day. Full steam ahead for Archives Space! 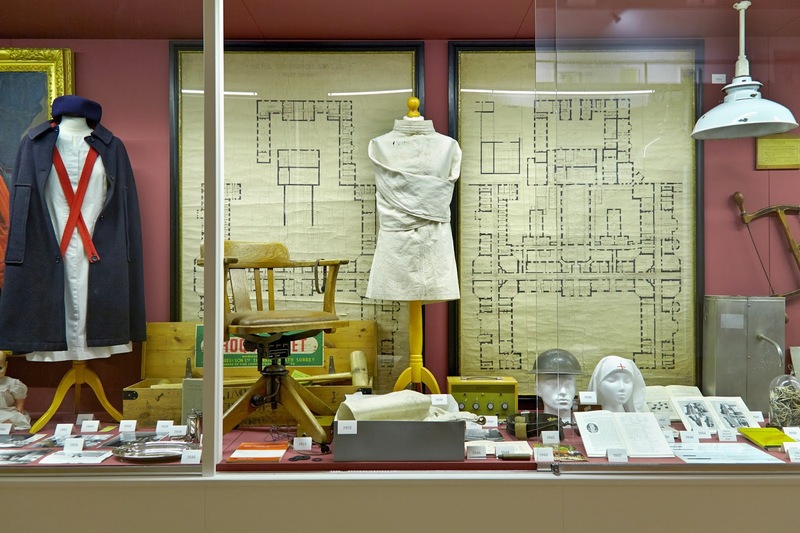 Among LHSA’s accessioned items which are in the process of being catalogued this year, is a collection of plans relating to Dingleton Hospital, Melrose. These items include male and female hospital building plans from the basement to the roof, heating plans, drainage plans and maps of the Melrose area with water mains highlighted. The hospital was opened in 1872 to provide for asylum patients in the counties of Roxburgh, Berwick and Selkirk, who had previously been treated in Musselburgh, on the outskirts of Edinburgh. The date span of the plans is over one hundred years from 1869 to 1972, although some of them are undated. Overcrowding quickly became a problem in Melrose, so the site was developed from providing 200 beds in 1872 to 440 beds by 1908 and the plans record some of these developments. A peculiar item among the plans is one of the piggeries, from 1905 when the hospital was known as Roxburgh District Asylum, Melrose, a section of which is shown in the image. Part of the treatment of mental illness in asylums in the 19th and 20th century was to provide regular work for the patients and the of rearing farm animals such as pigs and hens is also recorded in LHSA’s records of the Royal Edinburgh Hospital, formerly known as the Royal Edinburgh Asylum. These activities also helped to provide some additional income for the asylums before the days of the NHS. Some of the plans are in a fragile state and will require conservation work before they can be accessed. These varied and sometimes colourful items will make a fine addition to the GD30 series, already catalogued. Happy new year from the staff at LHSA! 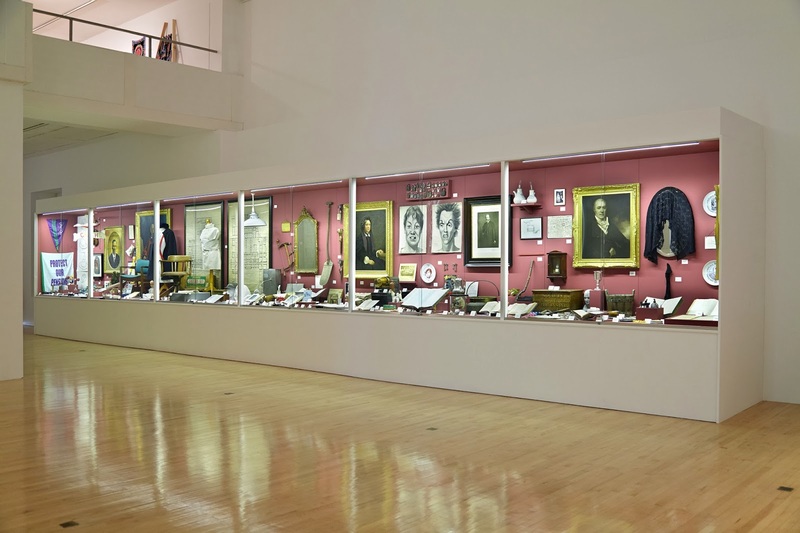 ‘200 years, 200 objects’ is on display at the Talbot Rice Gallery until 15 February. Please see the Talbot Rice site for opening times, admission is free. Don’t miss your chance to see lots of great LHSA items that help illustrate the Royal Edinburgh Hospital’s rich history. We’re also planning some talks and tours to accompany the exhibition over the next few weeks, so watch this space! 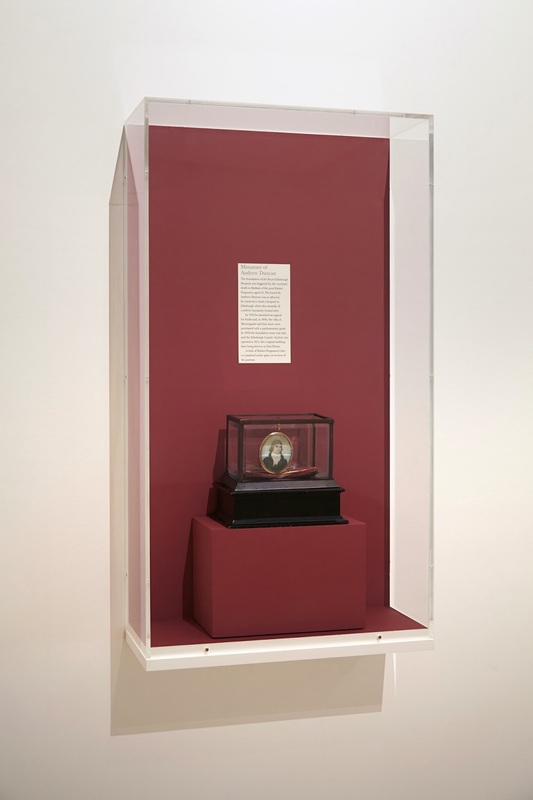 ‘Collect.ed’, a fabulous arrangement of material from across Edinburgh University’s collections, is on display until 1 March. Again, admission is free. Medicine bottles and a nurse’s chatelaine from our collection sit side-by-side with shells found by Darwin and fossilised raindrops, to name but a few of the wonders in Edinburgh University’s Main Library Exhibition Gallery. For information about opening times please click here, and for the exhibition blog for more insights, please click here. We’ll be back next week, and for the rest of the year, to tell you more about LHSA’s collections, what we’re doing and how you can get involved!